Vinyasa Yoga is a dynamic system of practicing asanas (poses). Yoga postures flow in a logical sequence. Each position complements those that precede and follow. 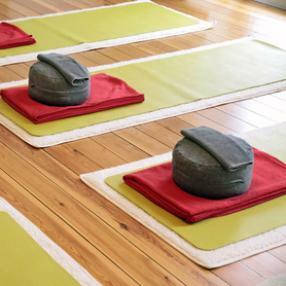 This practice focuses on the synchronization of breath & the continuous flow of movement. Vinyasa is a strong practice that builds heat, endurance, flexibility, strength and mental focus. This class can be strenuous; may be appropriate for beginners. A smooth flow to start your morning, all levels are welcome. Come groove, sweat, and giggle in this open levels morning asana practice! Moving through vinyasa sequences attuned to alignment of both body and mind, we play and rejoice! These classes are a mixture of flow, medium paced as well as very slow paced yoga, with asanas devoted to open up your joins and stretch your muscles, even though you may be limited in your strength, flexibility or stamina. Enjoy a lunchtime stretch in this hour long Yoga class and emerge relaxed and re-energized for the rest of your day. This is a yoga class which concentrates on physical health and mental well-being. Hatha yoga uses bodily postures (asanas), breathing techniques(pranayama), and meditation techniques(dyana) with the goal of bringing about a sound, healthy body and a clear, peaceful mind. The asanas work to make the spine supple, the core strong and supple and to promote circulation in the organs, glands, and tissues. Hatha yoga postures strengthen and stretch the body, promoting balance and flexibility. Vinyasa & Pilates fusion integrates Joseph Pilates’ methods for core training, focus and precision with the breathing, flexibility and flow aspects of a yoga practice. This class brings these worlds together to give you a complete experience of mind-body healing in a challenging workout. Be prepared to sweat! Open to all levels. Hatha & Bhakti Flow Yoga. This class is a well rounded yoga flow class that has the intention to open the student's body and heart to the sacredness within and all around. An introduction to vinyasa flow yoga where each pose is broken down more than an all levels class. A combination of Hatha (balance), flow, mindfulness and fun.